CHARLESTON, WV (April 5, 2018) – West Virginia was held to three hits by a trio of Greenville pitchers, while the Drive bats came alive for eight runs to silence the Power 8-1 on Thursday evening at Appalachian Power Park. West Virginia and Greenville continue their four-game series tonight at Appalachian Power Park, with first pitch set for 7:05 p.m. The Power will send RHP Travis MacGregor to the slab against Drive righty Kutter Crawford. Pregame coverage begins at 6:45 p.m. on The Jock 1300 and 1340 AM, www.wvpower.com and the TuneIn Radio App. For tickets and more information on a opening weekend, call the Power at 304-344-2287 or visit www.wvpower.com. 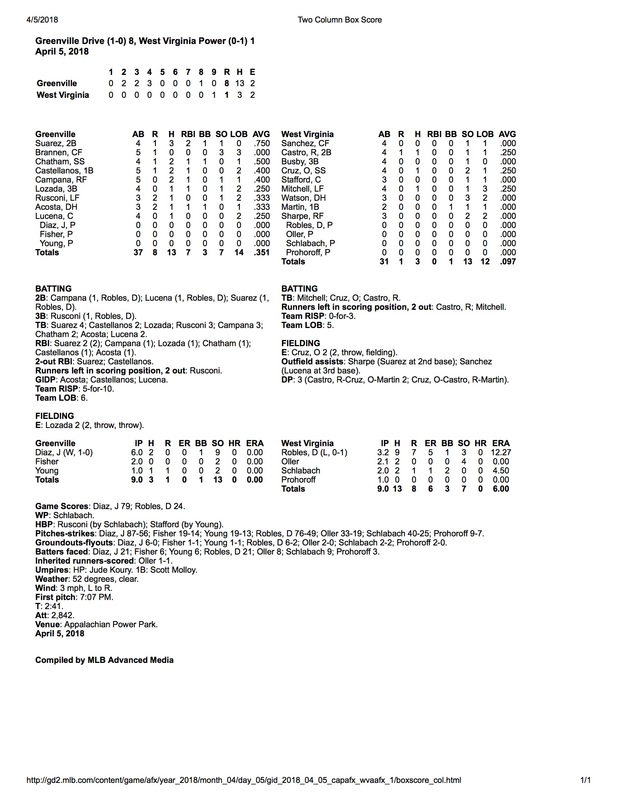 Thursday, the Power (0-1) scored their only run in the final frame of regulation, as Rodolfo Castro became the second West Virginia baserunner to reach second base after he singled to third base and advanced to the middle bag on a throwing error by Drive (1-0) third basemen Everlouis Lozada that sailed well over the first basemen’s head. The next batter, Dylan Busby, hit another sharp grounder to Lozada, who misfired on his throw to first again, plating Castro. Greenville starter Jhonathan Diaz (1-0, 0.00 ERA) silenced the Power hitters over six sterling innings of work, allowing two hits and one walk whil striking out a career-best nine men. Oneil Cruz and Calvin Mitchell were the only two West Virginia sluggers to crack the hit column against Diaz, both with singles in the second and fifth innings, respectively. Devon Fisher and Lukas Young finished off the Greenville victory with three innings of solid relief, striking out four and surrending just one hit. The Drive got the scoring started in the top of the second, when Jagger Rusconi tripled over Power starter Domingo Robles (0-1, 12.27 ERA) with two outs in the inning. Victor Acosta brought Rusconi home on a throwing error by Cruz, and, two batters later, scored himself on a scorched single to center by Kervin Suarez to make it 2-0. Three consecutive hits and a groundout by the Drive in the third tallied two more wins, as Marino Campana doubled in C.J. Chatham and Lozada sent in Pedro Castellanos on a groundout. Greenville posted a three-run fourth frame, ending Robles’ day in the process as the first four batters reached in the inning, including a run-scoring double by Suarez that brought home Acosta to give the Drive a 5-0 edge. 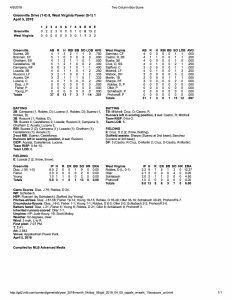 Suarez later scored on a Chatham ground out before Castellanos greeted new West Virginia pitcher Adam Oller with a seeing-eye single to center that saw Cole Brannen come in to score, beating Lolo Sanchez‘s throw by an eyelash. Oller tossed 2.1 strong innings of relief, giving up just two hits and striking out four. Ike Schlabach turned in two innings of work out of the Power bullpen, while Dylan Prohoroff spun a spotless ninth. Acosta tacked on the final run of the night for the Drive in the eighth with an RBI single that plated Rusconi. WV Power open season tonight: Wilson vs. Marvel at 7:05 p.m.